There's nothing that makes me more meh than the launch of "yet another battery car". Now that's not to say, I'm some sort of V8 Neanderthal (although I do like the noise of a proper sportscar), but batteries simply don't have the capability of supplanting liquid combustible fuels (no! Not petrol and diesel. 2nd Gen E100 Bioethanol). Sure those superhargers are nifty, but it's still 20-30 minutes of twiddling thumbs while you wait for it to charge up. "But MrFalconfly, electric motors are more efficient than Internal Combustion Engines"
Yeah and they still have the range half of normal cars. That give you an idea of the dismal energy-density of current batteries. So Tesla will be showing "The D" to the general public, then they will be selling "The D"? Color me interested, I want to see "The D". If I had to guess at the other bit, it's probably something to do with either the hyperloop or the gigafactory. I agree with you except that V8s are awesome. I'm in the Army and have to travel 1000 miles to go home on leave. I can make it in one day in my SUV but a battery car would take days because of the limited range and the recharge time is like 10-12 hours. Screw that. What I meant to say was that, although I'm an unapologetic petrol-head, I can be convinced to see reason, if given proper data. I also like V8s (and V6's and Straight-6's and V12's). It's just not V8 or nothing (I'd be missing out on some awesome sportscars like the Toyabaru Twins, or the Porsche 944 Turbo). I'm sorry MOPAR fans but I'm gonna have to say bland. But that's because the shite Dodge sells on this side of the atlantic is the Nitro and the Caliber. the main problem here is recharge stations. if you had as much recharge stations sprtead around as regular petrol stations recharging and reach would not be a big problem. Its also important to note that battery energy density has DOUBLED in the past 10 years while liquid conbustable efficiency has been mainly aimed at better efficiency engines, so if the trend continues the battery cars will outperform petrol ones in terms of distance. also whether its twiddling my thumbs in gas station for 15 minutes or in recharge station for 30, rarely is this a real problem. maybe its just that i dont usually drive everywhere late or something. Electric cars are a dead end. I normally wouldn't care about them but my stupid government is subsidizing them, artificially inflating the sales numbers. I even know one colleague who bought one that he doesn't even use and he's making money off of it just by having it stand in his garage. How stupid is that? I have to ask. What kind of monster do you drive? Because I haven't seen a car on any gas station that, unless the driver needs to find some food, has spent more than 7 minutes refueling the damn thing. Also, I doubt that the trend will continue (sure I hope that soldi-state batteries will continue to develop, because it'd be nice with more battery-time for my laptop). And while the distribution of charge-stations can be fixed that still doesn't fix the two other issues with EV's. Long charge time (which is a combination of how batteries work, and how much power you can cram through a cable, and I doubt we'll be able to get 1000km worth of power through those little normal charge-cables in only 5 minutes without something catching fire). And low range. Basically, the EV with the longest "legs" have a range of roughly 560km. A comparable Skoda Octavia 1.9TDI has a range of (if driven sensibly) 1200km. And btw, those 20-30 minutes was the numbers for a Tesla Model S at a supercharger, charging up to about 80% capacity. At any other charge-station, charging up to 100% it's still gonna be at least 1-2 hours. So I hope you don't need to do a mid-trip recharge. Has anyone thought about living and working in a thing called "City" ? Because there you don't need a million miles range. If the Charge-stations were wider spread, E-Cars would be all over the place. You shouldn't drive a million miles in one go anyways. Concentration decreases on repetetive tasks. So a break every now and then, even if you think "Ah don nead tad, ahm a MAN!!" could save your life eventually. Your average city commuter isn't going to make a 1200km drive daily, and will let the car charge overnight. You don't throw your phone out because it takes time to charge it, do you? Plus, not to mention electricity costs much, much less than gas (the half hour you wait at the supercharger station ensures you get the next 500km for free), insurance cost is lower for electric cars as is the maintenance cost as well thanks to fewer mechanical parts (no spark plugs, ignition system, oil changes, anti freeze). Performance-wise, max torque at zero RPM and a very low centre of gravity is always attractive. Electric cars might not make sense everywhere (Tesla still uses Ford F-250s to tow new cars state to state), but I end up shaking my head at people who think that they are somehow a dead end. Might as well as stick with petrol or diesel. Biofuel crops will increase emissions through land clearance, fertiliser use, and by displacing other crops (making food prices skyrocket). In one calculation, UK biofuel use in the first year of monitoring required around 1.4 million hectares of farmland (an area the size of Northern Ireland, most of it overseas) just to provide 3% of their transport fuel. Electric cars are a dead end. And fossil fuels are going to last forever. No I don't throw it out. But that's because there are no alternatives (I don't think it's expedient to start up a small modep engine every time I want to make a phone call). Regarding cars we DO have an alternative (that is equally green and has more flexible characteristics than batteries. 2nd Gen E100 Bioethanol). As for "Might as well as stick with petrol or diesel. Biofuel crops will increase emissions through land clearance, fertiliser use, and by displacing other crops". That is incorrect. 2nd Gen Bioethanol is made from existing waste-products of current agricultural produce. No need for displacing food-producing agriculture, land clearance, or extra fertilizer. We already have the resource, we just need to refine it. I'll introduce you to an old army saying. "One is none, two is one". Sure, for day to day use 560km range might be fine. But I quarantee you, you'll be kicking yourself the day when 560km ISN'T sufficient. The arguments against, 1st Gen Biofuels simply aren't applicable to 2nd Gen Biofuel. And no, the rest of the world aren't as vindictive against products as the US, who apparantly think that since one diesel-engine was bad then all diesel-engines ever must be bad. No I don't throw it out. But that's because there are no alternatives (I don't think it's expedient to start up a small modep engine every time I want to make a phone call). I should have looked that up before replying (since you made specific reference to send gen biofuel). Who knows what the future has in store - biofuel engines, hybrid biofuel engines or graphene supercapacitor batteries? That's a silly way to look at it. A driver who finds a small hatchback convenient to use in a congested city won't suddenly claim it to be useless if on one occasion s/he needs to carry a whole lotta people. I hope batteries develop (if not for EVs then at least to extend the life of my phone and laptop). As for the biofuel. Well I'd be a hypocrite if I said I never rushed into things without checking. And the old army saying. Well, no. But that's hardly relevant since electric cars have inherent problems that aren't just magically solved if the oil runs out. Not saying they don't work for commuting in the city, everything should have its niche of course. It's not everyone who are content with staying within the city limits. At the moment, Hybrid > Electric cars IMO. Electric cars have the serious problem of range and lack of infrastructure to support them. This would help a lot of we developed better batteries, more cars batteries should be lithium ion, and lithium ion technology could potentially be improved in the future if there's a market for it, which i think there definitely is. Personally i love my prius. By car definitely. At least in my country, where a very large portion already commutes by public transport. 1) My work place is 10 minutes by car. 2) To go around every place I usually visit during the week, I'd cover about 40 km a day. 3) To visit my parents in another country, it's a 210 km round trip. 4) To visit my relatives "down south", once a year, it's a 500 km round trip. Judging by the range on model S with a lower capacity battery, you get about 238 miles = 383 km per charge. If I could get this car where I live (the Balkans), I'd be singing all the way to the car shop. Not only can I cover any trip I'm likely to take (apart from vacation, where airplanes are the weapon of choice anyway), but I would save a lot, since gas prices around here are at least twice what they are in the States, for example. My 2 cents, and all that jazz. Would love one, I live in Central London and would rarely travel far outside of the city. However I have a large family, and we wouldn't fit. Electric people carrier, no? So Tesla will be showing "The D" to the general public, then they will be selling "The D"? Color me interested, I want to see "The D". Musk does it intentionally. Their luxury sedan is called the Model S, the upcoming cheaper sedan was supposed to be called Model E (before Ford threw a hissy fit and they changed it to Model 3) and their SUV is called the Model X. So their entire range consists of S-3-X. but it's still 20-30 minutes of twiddling thumbs while you wait for it to charge up. Except that mostly you're filling it up at home, taking rather less time than periodically stopping for gas. Sorry, lad, but the numbers are not on your side, by a huge margin. Daily travel of more than 200 miles is the niche - and an itty-bitty niche at that. 1) Yeah, that's fine and dandy when I'm at home. But what do I do if I'm on the motorway and the gauge says 0%? 2) Well, grand tourers are a niche, but so are the people who only ever stay within the city-limits. And I suspect that mr Kennetic has about 1000mi from the nearest airport to where he lives. I haven't been following the development of electric cars; how significant should this unveiling be? It's worth pointing out that aside from the current Tesla Model S having more range than any other EV I know of, Tesla is also aware of the charger problem and are building their own super charger stations around the country which can be used for free, and are located near restaurants, shopping centers, etc. So if you need to charge for an hour, pop in somewhere and have lunch too. I believe they may already have enough built to make crossing the US a relatively simple endeavour for most people, and they're only planning to build more from there. But even ignoring the long range questions, 99% of my driving is in the city and I don't usually drive more than 100km a day tops. If I could afford an EV right now I'd definitely get one as a daily driver and keep a less expensive, but still fairly fuel efficient, petrol car for longer distances. And considering there are times that both my wife and I would benefit from having two cars, it's not an unreasonable proposition. A lot of family's with two or more adult drivers will have multiple cars and how many of them really need the range a petrol engine provides most of the time? When is he going to make a small 2 or 4 person micro car or a scooter/cycle that more people can afford? I know some of the price on what they are selling goes to the free charging stations. Although, there is probably many people who could benefit from EVs, but can't afford the pay up front full costs or for all those luxury gizmos. I still say battery technology isn't ready for decent EV use, actually. Lithium ion and NiMH batteries currently degrade too fast for them to be a good investment for a car (read my next paragraph for more on that). Li polymer bats are relatively new and still have problems like costing more than and having lower energy density compared to Li-ion. Charging from utility lines presents the problem that the incoming power might not be cleanor efficient. There's also the issues that manufacturing electric and hybrid cars create more pollution than conventional cars and their disposal creates similar pollution problems Their regular use offsets the emissions from making them, but remember, cars can get into accidents that total them and they still remain around after they hit the end of their usable life. I'm still waiting for cleaner, longer lasting, higher capacity battery tech like super capacitors to reach commercial production capabilities. Thanks to hippies, ignorant (or greedy) politicians and their voters, 45% of power comes from coal instead of nuclear energy or renewable sources. Hybrid or conventional, all of them still have nasty juices and materials like grease, oil, brake fluid, transmission/gearbox fluid, e-waste, rubber and other bad mojo. The EVs have all of those but engine oil and maybe trans fluid, depending on how their motors are coupled to the wheels. We will still have an infrastructure of harmful chemicals that can seep into the environment either by accident or on purpose. i drive a mitsubishi lancer that runs on petrol. i wouldnt call it a monster, but its not the weak and eco friendly type. In those 15 minutes i have counted in having to go pay for gas and the like, obviuosly. and its not like i put a stopwatch when i go to gas station so its estimation from memory. well there is a lot of money poured (and gainled) from solid state batteries developement. mainly because its just so profitable to have your laptop/tablet/phone last longer than competition. but it also helps other industries as well. I dont know how much we can do with it in the future, but thats a question noone can answer. and lets not do it like we did in 70s - where they thought the future will be the same and no advancement made, because that was obviuosly false. even regular home rated cables can actually handle quite a bit of power. specific charging station cables will likely be designed for more. but thats all guesswork now so lets not do that. i understand that these 20 minutes were for the supercharging stations, but they made that patent public last month and now everyone can use the supercharging stations if they want to. as far as range is concerned, if we got enough refill station it matters less. also 560km is more than the longest distance from one end of my country to the next end, so for somone living here its way more than enough. heck, if you drive a larger distance than that in a day and you dont do it in no-limit autobahns or something you should take a rest to begin with, since your driving fatigue makes you a danger of wheels. DONT drive for 1200 in a day. there is a reason truck drivers are heavily regulated not to drive for more than 8 hours in a day. and that reason is safety. But I quarantee you, you'll be kicking yourself the day when 560km ISN'T sufficient. sorry, this sounded funnier in my head. no, blame yourself for complete failure of planning to the point of not even bothering to check whether you got enough fuel till next gas station and then call a tow truck. im aware they are trying. there is however one (1) recharging station in my whole country. so yeah, not there yet. 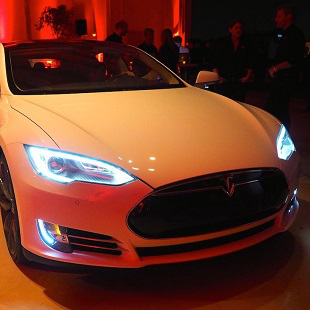 Unofficial (read: UNOFFICIAL) leak says "The D" is a dual motor version of the Model S, making it all wheel drive. And faster. 1) When I said "monster" I was referring to the size of the tank. I've refueled my Skoda Octavia plenty of times and (paying for the gas included) has never taken me more than 6 minutes. 2) Bugger. Fast typing, and using a second language really get's me out on deep water some times. 3) So I have to plan every stop and start of my trip? I can't just get behind the wheel and drive to wherever? Well what's the bloody point then?! If I'm going to minutely plan my trip, I might as well take the bus. I like the car because it's so incredibly flexible. I don't have to plan. I can just go where the wind takes me. And if the tank is dangerously close to empty then I just have to spend 5 minutes refilling it. Really cool. I love the idea of electric cars and have promised that my first car will be electric. Would love for it for be a Tesla Model S but sadly, I'm not that rich. No kidding. The Tesla roadster had a 500 kg battery to manage it's comparatively massive range. By weight, the petrol has 1000 times the energy density of batteries. The fact that electric vehicles still manage to have the ranges they do is down to electric motors being somewhere in the region of 3 times as efficient as petrol engines. The entire concept is hamstrung by a single technology. The battery. 560 km is a lot. Granted I've generally only owned rather old cars, but I can't think of many petrol vehicles with a range much past 500-600 km except for a few specialised 4wd ones that typically do it by having two fuel tanks. For petrol vehicles it means usually means refuelling 2-3 times in a trip of that length. But... EV charging times can be a lot longer, and this country has essentially no infrastructure. While 500 km range isn't an issue if you can refill in a few minutes, it becomes rather crippling if charge times get into the 12+ hour range. (Which, without specialised infrastructure, is almost always the case). 30 minutes isn't ideal, but is manageable, especially if it's possible to do alongside something else.